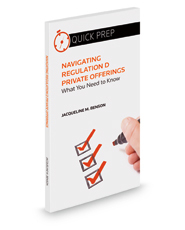 Navigating Regulation D Private Offerings is is an essential guide for companies planning to conduct a private placement securities offering pursuant to the Regulation D exemption from federal securities registration. Learn about the different exemption alternatives and the requirements of each, the differences between Regulation D offerings and crowdfunding offerings, and the typical documents used in Regulation D offerings. This book provides and describes the definition of “accredited investors” and explains the differences between offerings to exclusively accredited investors and offerings to both accredited and unaccredited investors. Navigating Regulation D Private Offerings clarifies the interaction between state and federal securities laws and explains offering terminology in plain English. This book, written by an attorney with over 15 years of experience with securities laws, will help you communicate with confidence with prospective investors and work more efficiently with your counsel. If your company is planning to raise capital, this is the book for you.